Swords And Soldiers was one of the best-selling early titles released on the WiiWare service and rightfully so. Published by Two Tribes Games Swords And Soldiers was a strategy title that had players command the Vikings and other armies against one another in sidescrolling fashion. You must hire miners to obtain gold and then send attack units into battle all while using gold to build up mana so you can heal your units to prevent them from falling in battle. These are just the basics and as you progress through the campaign mode you will find that the game has a lot of strategic depth to it. There are other returning modes as well such as the straightforward skirmish mode where you face off against a cpu player in pre-set conditions. You can earn achievements which normally don't serve much of a purpose, but thanks to Miiverse you can show off your achievements to your friends for bragging rights. Swords And Soldiers HD brings to the table a new multiplayer mode which is a fun distraction from the campaign and can be a challenge if your friend is a battle hardened Swords And Soldiers pro. Swords And Soldiers requires the use of the gamepad which is disappointing given that the point and click controls of the Wiimote were more enjoyable than the touch controls of the gamepad. 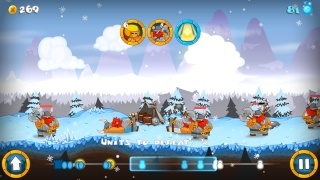 Swords And Soldiers has simple and colorful cartoon inspired graphics that give the game a cute and lighthearted character while the music is also lighthearted and cheerful. This might seem strange for a war-based strategy title, but it somehow works with Swords And Soldiers. The only thing that stands out is that it really doesn't look like the game is in true HD, but regardless it looks impressive even on a SDTV! 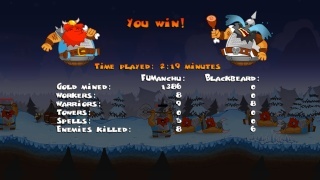 Final Verdict: Swords And Soldiers HD is an high definition reboot of the popular WiiWare title Swords And Soldiers. 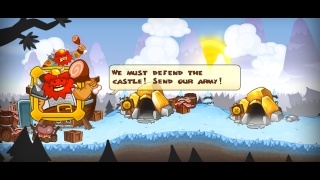 The game has exciting new modes and improved graphics over the WiiWare version of Swords And Soldier, but not everything has been changed for the better as the point and click controls of the original version of the game were much more enjoyable than the newly added touch screen controls. Even with the negatives the game has enough new content and at its ultra low price you would be foolish to pass up this game even if you already own the WiiWare version of the game. Thanks for another amazing review. 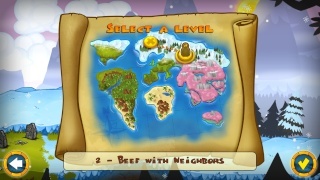 The addition of multiplayer is the only reason why I'm considering downloading this game again. I already have Swords And Soldiers for Wii.